Today I got a second package from Vampira. It was spooky and I proceeded with caution. Will there be spiders coming out, or maybe a bat. It was a trick or treat bag, humongous in size, I will be taken candy from the children this year Mwahahahaha! There were some friendship notes as well. 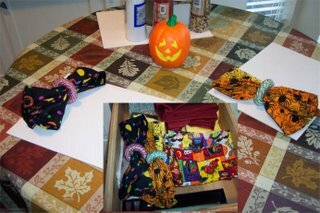 Today as crafty as I am, it was decided to use the fabric that she has given me and make napkins for the season. Halloween Napkins, perfect for the eery dinner, or that unexpected quiet moment. Great conversation started or maybe it will end your conversation . Alas here they are my new Napkins courtesy of Vampira. Thanks for stopping by, maybe I will see you after midnight? I really like those napkins. That's something I never would have thought of doing with the fabs. Thank You! I thought it was a nice idea, and since they were a gift, I wanted to use it!